I am excited to bring to you a new episode of the Everyday Heroes series, in which the readers of Vegan Runner Eats tell us about their journeys to becoming vegan/plant-based. 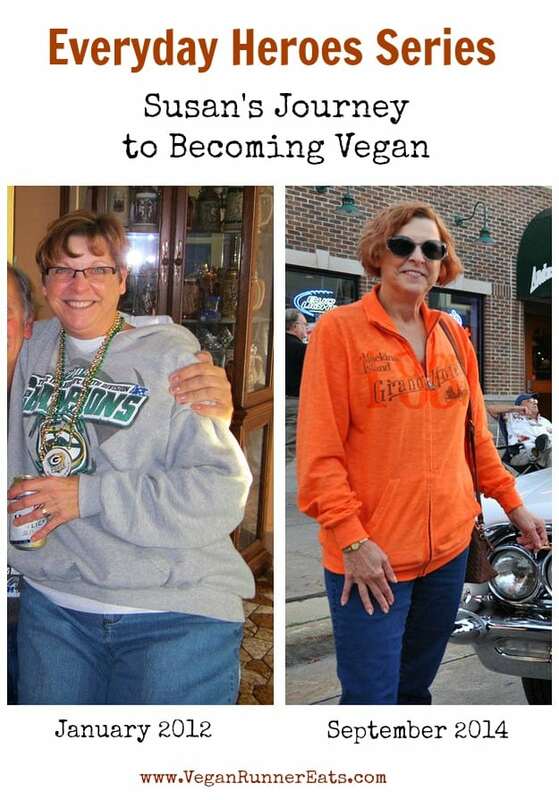 Please meet Susan from Wisconsin – her journey began a year and a half ago, and while she’s not a 100% vegan yet, she’s been on the right track to make all of the important changes in her diet and lifestyle. In the last year and a half, Susan has lost weight and improved her cholesterol and blood glucose levels. Besides her motivation to become healthier, Susan is also driven by her love for our planet. An avid hiker, Susan appreciates the beauty of our planet and makes a conscious effort to reduce the amount of waste her household produces. 1. Introduce yourself: your first name, city, state. My name is Susan and I live in Appleton, Wisconsin. I am 62 years young and work as a licensed mental health therapist. 2. What has your journey to becoming plant-based/vegan been like? What helped you become more conscious about what you eat? My decision to include more plant-based products into our diets, besides the obvious health benefits shown in my ‘before and after’ pictures, occurred because of my passion for the planet. In our family, we eat “in season” items as much as possible, thereby reducing the pollution caused from flying strawberries to Wisconsin in December. We strive to reduce our carbon footprint and contribution to the landfill. In a good month, I open only 2-3 tin cans. I have a 10’ x 30’ garden that I harvest and can or freeze as much as possible. All scraps are used to make veggie stock and then everything goes into the compost bin to keep the garden self-sustaining. The rain barrel collects most of the water needed except in the driest of summers. It’s not a perfect system, but our trash container doesn’t even go to the curb once a week. We joined a CSA, mostly because we like veggies and wanted organic ones as much as possible, so taking the next step needed little urging. It came in the form of a wonderful gift. On September 3rd, 2013, after a 3-day camping weekend, I weighed in at 144.8 (I am 5 feet 4 inches tall). Somewhere around September 10, 2013, I received the best gift: a new book with a note that said, ‘Happy Tuesday Suze! This just might push you over the edge to weightloss freedom! Love and hugs, Jen’​. The book was Mark Bittman’s Vegan Before 6 . I was immediately inspired by Mark’s success, and I have been following his plan for about 15 months now. I replaced all breakfasts and lunches with vegan meals. But then I was further inspired to replace most of our dinner meals as well. 3. What changed for better (or worse) in your health and outlook since you added more plant-based meals to your diet? These were the important numbers. The doctor was not happy with my being pre-diabetic and I’m hoping when I have my check up in March to have the glucose number under 100. All my other numbers came into line as well: triglycerides, LDLs, HDLs, etc., as did my husband’s numbers, which improved even more than mine did! 4. What challenges do you experience as someone who decided to go vegan living in your area? How do you overcome them? Challenges you ask? I live in Wisconsin – the Dairy State! We are called Cheeseheads! The population is also quite obese, so just mentioning vegan or vegetarian diets usually results in rolled eyes and groans. However, most of my friends have been very supportive. They have no problem trying anything I’ll bring to a football gathering knowing that it’s likely vegan. They even have a few favorites now, and why not? I’m often asked to bring this Vegan Spinach Artichoke Dip because it’s the best! And really, shouldn’t food be based on how it tastes and not on its genre?? Does it have to be bad because there is no meat in it? Or if it’s made with nutritional yeast instead of cheese? Most people don’t even know if you don’t tell them. 5. Tell us about your hiking experience. Did you notice any physical improvements in your endurance since going vegan? Do you do any other forms of exercise? We hike a lot when we are camping and I like to lift some weights. But these are things I’ve always done, so I haven’t seen a lot of difference. I do feel that I have an overall increased energy level though. I used to run a few 5K races each year and I’m strongly considering getting back into running. 6. Cooking. Where do you find inspiration? What are your favorite recipes? Lately I’m into spiralized veggie recipes. Spiralized wraps are the best. Instead of slices of veggies the “noodles” seem to have an extra crunch to them. I drizzle on a little vinaigrette dressing and lunch is served! Mark Bittman’s Vegan Before 6 contains several good recipes, and I subscribe to a number of websites, both vegan and vegetarian. I always look for recipes that are healthy and use real food. I now count chemicals instead of calories. Even if it’s vegan, it has to be pronounceable. 7. Any advice for those who just switched to a vegan diet/lifestyle? Give it some time. Change doesn’t occur overnight. Which is why I think part-time vegan is such a great way to start. You can ease into it. Experiment with different things to find what suits your taste. And find websites with bloggers that will interact. There is nothing greater than to ask a question from a blogger and receive an answer or get a bit of dialogue going. Knowing that support is out there is great! Thank you so much Susan for sharing your story with us! Good luck to you and your family on your journey towards becoming vegan. Please keep us updated on your progress! To see all other posts in the Everyday Heroes series, click here. In case you’ve enjoyed this post, please share it with your friends! And stick around for more awesomeness – you can follow Vegan Runner Eats by subscribing in the top right corner of this post, or by following the blog on Facebook, Twitter, Google+ and Instagram! Tagged Everyday Heroes, health, Mark Bittman, whole food plant based diet. Bookmark the permalink. Wonderful story that is still unfolding. The choices we make are important to the health of the planet and ALL its inhabitants. Thanks for making the effort, Suze. I borrowed your veggie stock habits long ago and hope lots of folks will read and adopt some of your carbon-footprint reducing practices. Thanks for sharing these real vegan-journey stories, Alina! Glad to hear that Susan’s story touched you, Jen! By the way, if you ever feel like sharing your own story here on Vegan Runner Eats, I’d be happy to feature you! Congrats to Susan for all these amazing changes! I too began my vegan journey with Mark’s book, transitioned pretty quickly and have been vegan since December 2013. Every step counts towards your health and that of our planet and animals. 🙂 P.S. I’m also from Appleton, although I moved to Phoenix, AZ two years ago. So cool to see someone from Appleton featured on a vegan blog!! It’s a small world, Julie! Glad to hear that being vegan resonates well with you, and nice to know that you’re also a runner. I’ll be checking out your blog! Wish you were still in Appleton! I’d like to start running again, but it’s -2.9 this morning!! I love your blog!